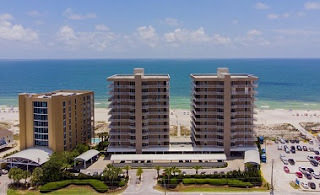 Perdido Key Condo Sales-Rentals: Mediterranean Condominium For Sale in Pensacola FL. Pensacola FL. gulf-front condo for sale at Mediterranean. Experience the taste of the exceptional life at The Mediterranean At Perdido Key! This 4 BR, 4.5 BA Condo with 3,383 Sq Ft is one of the most exclusive and luxurious destinations in Perdido Key. Jaw Dropping views of the Gulf and Old River from the balcony that spans the whole east side. Exceptionally maintained with private balcony access for each room. Gated, Private and low density. Elevator opens up directly to the condo. Beautifully decorated and open. Sugar white sands and emerald waters create the ideal setting paired with its idyllic beach front location right next to Flora-Bama and Old River. There's more, come see this condominium!